Meet Floré. A painter and mother of three, diagnosed with Alzheimer’s. After a series of admissions to various medical institutions, Floré’s restless wandering, fits of aggression, and destructive behavior brought on an increase of medications – and a severe decline in mobility and nutritional health. They said Floré would never walk again, and recommended that she be placed in a secure locked unit. Floré proved them wrong. Chronicled over a three-year period, this scenic and beautifully filmed DVD shows the power of love and individualized care, and also demonstrates the potential resilience of persons diagnosed with Alzheimer’s. Filmed through the eyes of Floré’s son (and Floré herself), the DVD gives us an intimate passenger’s view of Floré’s journey. It starts with her diagnosis of Alzheimer’s, documents her early changes, and takes us through her multiple treatments and relocations. 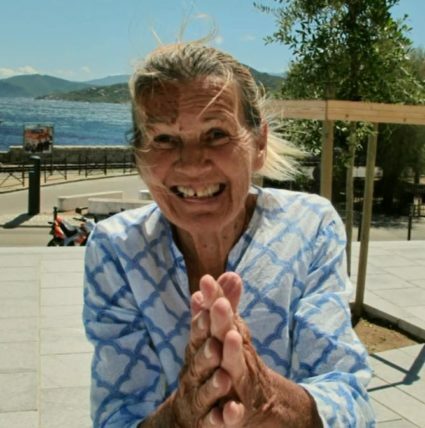 We are there when her son rejects the recommendation to finally relocate her to a secure unit, and decides to bring her back home to Corsica – to the life and surroundings she knew and loved. Home again, amid the lush green countryside, gentle ocean waves, sandy beaches, and hiking trails, something happens – Floré slowly starts to “blossom”. With the assistance of home caregivers and medical staff, and through trial and error, Floré is encouraged to re-engage in life and activities. She arrived in a wheelchair, but she soon gets the urge to stand, then walk, then swim! She slowly starts to eat again and connect with others and her environment. Floré’s “alternative therapy” transformed her. A loving tribute to a cherished mother and a hope-filled empowerment tool, this film inspires families and caregivers to reach toward (and succeed in) giving persons with Alzheimer’s the best lift possible. A must-see film!